The October 10 episode of CBS’ Tom Selleck vehicle Blue Bloods has drawn criticism from Catholics after the lead character proclaimed that the Catholic Church was “behind the times” on gay issues. The episode, entitled “Burning Bridges,” presented New York Police Chief Frank Reagan (Tom Selleck) facing a sticky situation over questions of a gay police officer involved as a witness in a gay bashing crime. In the series, Chief Reagan is a staunch Catholic, but as the head of the NYPD he must follow city and state rules on gay employees. Members of the press raise this dichotomy as they question the chief over the gay bashing incident. Responding to the media, Chief Reagan stumbles through his feelings, ultimately saying that he felt the Catholic Church was “behind the times” on gay issues. This plot line sparked criticism from the Catholic League’s Bill Donohue, who wrote that his Catholic League has “been bombarded with complaints following the last episode.” It all made Donohue wonder whether CBS was “turning on its audience” by injecting the anti-Catholic subject mater into a series that has in the past been generally strong on traditional values. The Bible is ‘anti-gay.’ That is the logical conclusion that unfolds in this episode. The show also misrepresents the sexual abuse scandal: almost all the molesting priests were practicing homosexuals. Moreover, the scandal ended in the mid-1980s, thus showing how far behind the times the show’s writers are. As for the wavering cardinal and the wayward nun–it is what we would expect from writers who have decided to pivot. One of several scenes that drew the ire of Donohue’s Catholic League is midway through the episode, as NYPD Chief Reagan is presiding over a press conference. A reporter stands to ask if the officer who witnessed the gay bashing earlier in the episode was a “detective who is a closeted homosexual.” Reagan says he cannot confirm that fact. Looking perturbed, the Chief then delivers the line that incurred the Catholic League’s criticism. “Well, I do believe the Church is a little behind the times on this. But, then, I still miss the Latin Mass,” the Chief says uncomfortably. The episode also features a proud lesbian turned Catholic nun and a scheming Cardinal who uses political maneuvers to get Chief Reagan to attend a fundraiser as payback for keeping a local Catholic school open, an offer that is rescinded as soon as the “behind the times” quote is uttered. 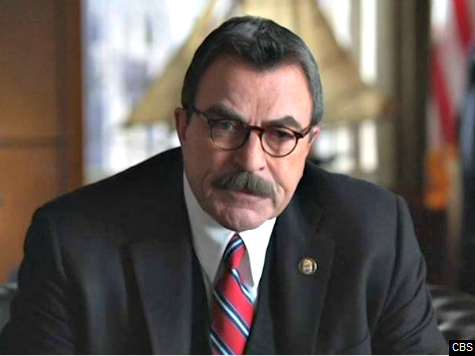 Blue Bloods star Tom Selleck is famously far more conservative than most in the entertainment industry, and the show has generally been one of the most family friendly series on TV-often touting duty, honor, fidelity, and traditional values-so it isn’t surprising that some might be shocked by this more liberal plot line. IS “BLUE BLOODS” COMMITTING SUICIDE? We’ve been impressed with the underlying positive message of “Blue Bloods” over the years, as well as its welcome treatment of Catholicism. But after last Friday’s show, we’re now wondering whether CBS is turning on its audience. We’ve been bombarded with complaints following the last episode. Police Commissioner Reagan cannot defend the Church’s teachings on homosexuality, so when Catholicism is branded an “anti-gay faith,” he replies, “Well, I do believe the Church is a little behind the times on this.” Indeed, he goes so far as to say, “I do believe the Church is backwards on this. And of all the stands to hold onto. In the midst of the scandals of the past decade.” Viewers also meet a conflicted Cardinal Brennan, and a proud lesbian, Sister Mary. The Bible is “anti-gay.” That is the logical conclusion that unfolds in this episode. The show also misrepresents the sexual abuse scandal: almost all the molesting priests were practicing homosexuals. Moreover, the scandal ended in the mid-1980s, thus showing how far behind the times the show’s writers are. As for the wavering cardinal and the wayward nun–it is what we would expect from writers who have decided to pivot. Is CBS committing suicide? The audience for “Blue Bloods” has been carefully cultivated, so the price tag for alienating its base is high. Time will tell.